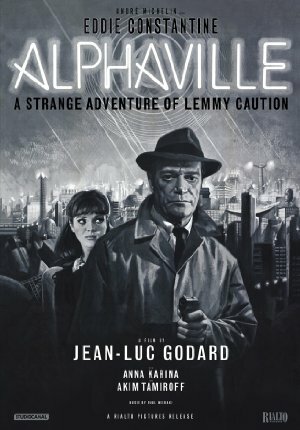 PiF Magazine: In many ways, Jean Luc Godard’s Alphaville remains cinema’s most unconventional science fiction film. With science fiction, filmmakers usually ask the audience to believe that certain technologies have advanced, or in the case of dystopian scenarios such as the brilliant Blade Runner, that technologies have advanced and subsequently corrupted society, standing as a testament to the foolishness of blind faith in progress. Godard, on the other hand, has made a film that asks its audience to take downtown Paris as the center of the galaxy by eliminating all special effects and simply shooting the film in the nocturnal, fluorescent and neon lit interiors of hotels and office buildings. That this technique works so well (much better than many films with millions of dollars worth of effects) represents only one of the triumphs of this remarkable work. Thompson on Hollywood: ‘’Reality is too complex. What it needs is fiction to make it real,” intones the computer at the film’s beginning. "Alphaville" exaggerates reality. Godard and cinematographer Raoul Coutard did not flood Paris with light. Instead they photographed at night on real Paris locations in order to make a film with the creepy feel of a nightmare. The Guardian: Eddie Constantine, the expatriate American actor, had already played the weatherbeaten FBI agent Lemmy Caution in several French films based on a series of novels by the British writer Peter Cheyney (sample titles: Dames Get Along and This Man Is Dangerous). Godard invited Constantine to reprise the role and sent Caution into the future, keeping the B-movie conventions intact along with his personal accoutrements – American car, Zippo lighter, raincoat, trilby, button-down shirt. Caution arrives in Alphaville on a mission to find a lost agent and assassinate Professor von Braun, the architect of a state whose people are ruled by logic and science and have been purged of emotion. All the elements combine beautifully. Raoul Coutard's black-and-white photography turns everyday objects and settings – a hotel lobby, a swimming pool, a room full of mainframe computers, a jukebox, a Kodak Instamatic, the Paris suburbs at night – into the props of a convincingly dystopian futureworld whose philosophy is outlined in voiceover by the grating, inhuman tones of Alpha 60, the computer that regulates life in Alphaville. (Godard had the lines intoned by an actor who had lost his larynx and spoke through an artificial voice-box.) Paul Misraki's excellent score enhances moments of tension with warning stabs of low brass. Movie Mezzanine: Alphaville is almost 50 years old now. It’s hard to focus completely on the formalist aspects, frankly, when you’re distracted by how damn prescient the whole vision is, or was, or has become. Scarred by the wars he’d lived through, Godard’s image of the next era is of a society where capitalism and technology band together to banish individualist thought and sincere emotion. Where advanced weapons of destruction are created, using the latest cutting-edge equipment, to reign down death upon ‘less advanced’ enemies. Where algorithms rule culture and science and research and man sits by and accepts their findings. It’s hardly a snapshot of contemporary life, but it’s hardly without parallels too. Rumor has it Godard originally wanted to title this picture Tarzan vs. IBM. Now the movie’s being rereleased back into the world, after that fight was fought, now that IBM has capably won, so to speak. Emotion may not be outlawed, but the computers certainly conquered contemporary life, they have made wars more destructive, they have fused themselves to our thought process, they have obtained command of many aspects of the decision-making process from the human mind. That makes Lemmy and Godard’s plight all the more tragic, their dark-in-palette projections all the more haunting, their re-wired entry in a already-pitiless genre all the more hopeless. It’s an irrevocably bleak hallucination, this film, and one of a future that has in some ways already arrived. Raoul Coutard’s photography, even, looks like the flip side of the all-sleek-all-white-everything Apple-look that’s currently in vogue; inky blacks flattening out each frame; from the night skies, from Karina’s coat, from a shadow cast by menacingly-angled piece of architecture. If an iPod commercial had a nightmare, it would look like Alphaville. LATimes: For Godard, whose marriage to actress Karina was coming apart at the time, "Alphaville" was in part about the importance of love and human connection in a world where technology was warping interpersonal contact. Those issues have not gone away, they've gotten stronger and more pressing with the passage of time. Yes yes yes. I have this weird thing with Godard - or maybe it's not me it's him - but I feel compelled to watch his movies and never like them or even consciously find them resonant. They are not beautiful or moving. But they are... something... that is extremely compelling and Alphaville is the something-est of all. I had never heard the Tarzan vs IBM thing but, yup. That's part of it anyway.